All the great sociologists, in the tradition of Georg Simmel, Max Weber and others, are on a mission. They cannot help wishing to change the world. Science should be value-free, but the social sciences have never come close to that questionable ideal. All science is a human endeavour, indeed always one rooted in society. There is no position, theoretical or descriptive, that will or cannot change, or that isn’t subject to paradigm or point-of-view, perspectives that are rooted in time and place. Richard Sennett, while always trying to be fair and open-minded, in tune with his political leanings, is bound to a number of specific values – close to Karl Popper’s idea of the ‘open society’. This is an approach that avoids dogma, received ideas and narrowly-defined oppositions and a shifting perspective that plays with paradox and ambiguity rather than being bound by certainty. This book is a cry against the standardisation of cities, the pre-eminence of decisions based on profit and facilitated by corruption. A cry as well against the smoothing-out and ‘user-friendly’ priority of an urbanism that would make a life that flows as smoothly as possible and ignores, attempts to by-pass, or worse, flattens the obstacles - social, economic and cultural differences – that make living in the city both a challenge and a joy. Sennett is never quite sure if he is writing a comparative history of the growth of cities or a critical history of city planning. He sometimes navigates the difficult connection between theory and practice with deftness. And yet, at others, the connections feel clunky or even difficult to follow. Moments of insight and brilliance are followed by convoluted excursions into arguments that never feel sufficiently articulated. The book contrasts the approaches to urban change promoted by three “visionary amateurs”: Baron Haussmann in Paris, who pulled down large parts of the medieval city to create a simple network of wide boulevards and avenues (see aerial view, pictured below); Cerdà, the creator of modern Barcelona, who favoured an “additive” approach to city-planning, focusing on buildings rather than public spaces, and creating blocks which could be added to in time. And Olmsted, the creator or New York’s green oasis, Central Park, a space in which he hoped that different social strata in the city would meet and mingle. None of these major projects produced the intended results, and Sennett makes much of the tendency of interventions on the fabric of cities to develop a creative life of their own, independent of the ‘plans’ wilfully imposed on the urban environment. He is an advocate of the unplanned, the piecemeal and the improvised, as well as of the way in which obstacles and apparent failures often have a way of generating creative solutions. The Parisian sidewalk café, for instance, a place in which a new style of conviviality, open to the street, but not bound by the mix of customers characteristic of old style taverns with their communal tables, grew out of changes to shopping and walking habits that the wide boulevards unexpectedly brought about. Obstacles and apparent failures often have a way of generating creative solutionsSennett is concerned with “the ethical problems of cities today: should urbanism” he asks,” represent society at it is, or seek to change it?”. He brings with him a great deal of experience as a consultant, both on small decision-making processes at the level of community and on larger-scale plans. He hs a tendency to show off his erudition and the range and depth of his knowledge can get in the way of a clear argument. Some of the connections he makes with literature are less than convincing: following a fascinating exploration of Tocqueville, who coined the term ‘individualism’, he cites Musil’s The Man Without Qualities which he mistakenly claims “focuses on a nameless character” while the man in question is clearly known as Ulrich. Ulrich is the man without “Eigenschaften” and Sennett claims that this is hard to translate and suggests that Musil means “prickly, particular, rough”, as the book’s main character is able, he claims to see things more deeply not in a smooth and unambiguous way. To understand Vienna and the decaying Austro-Hungarian Empire with greater subtlety. This is a piece of invention as the meaning of Eigenschaften is clear enough – it unequivocally means ‘qualities’ and to suggest anything else only leads to confusion. This is just a small example, but there are other moments in the book when the undoubted erudition seems inappropriate and contributes to the often cloudy and at times obscure feel of the essay. The more theoretical sections of the book – in which he draws from a very wide range of thinkers, from Husserl and Heidegger to Lévinas and Bachelard – are fortunately counterpointed by specific and more obviously relevant or accessible examples of processes that Sennett has observed or participated in: from the barrios of Medellin to the South Side of Chicago. Sennett is a canny and seasoned observer and he has, in a way, learned more lessons from active engagement with street life or specific interventions than through his extensive reading in philosophy and psychology. He values walking, as opposed to driving around with the help of Google Maps. He connects with the city-wandering of the flâneur, a leisurely explorer of neighbourhood and streets, free from goals or specific directions. The book is underpinned by a number of leitmotivs and models, not least the very open and experimental working methods of MIT’s Media Lab, with whom Sennett collaborated: a practically engaged research establishment that favoured creative bricolage in which ideas could fly around freely and interactively. 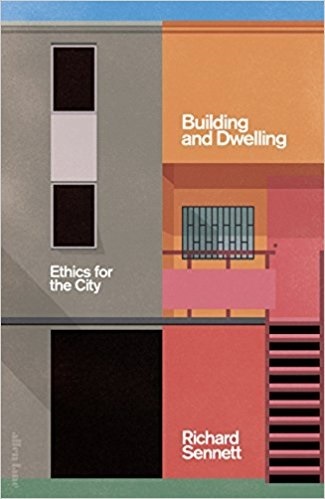 More fundamental is the distinction in draws between the ville and the cîté, a dichotomy that mirrors in part the Augustinian idea of City of Man and the City of God: the built city and the way in which ‘citizenship’ is lived within this built environment. Defined in this way, the duality seems to make sense, and yet when he returns, very frequently, to these two terms throughout the book, it is often difficult to see whether he means these abstract ideas to overlap or resonate with each other, or whether they are mean to provide descriptions of objective reality. This may be one of the inherent weaknesses of social science, part poetic art and part rigorous analysis. The borderline nature of sociology has inherent weaknesses: the discipline tends to drift into a confusion that encourages generalisation, yet pleads for a myriad of special cases, as Sennett seems to do on a number of occasions in the book. Even if authors pretend to be in control of their work, writing is, inevitably, a creative activity in which the writer is in some way ‘possessed’ by his subject, more specifically, the particular perspective that shapes his or her approach. As an author, it’s immensely difficult to free oneself from qualities intrinsic to the subject at hand. In seeking to explore the tangle of cities, places in which every aspect of humanity is churning away in an ever-changing melting-pot, it’s as if Sennett had been conditioned by the labyrinthine and continuously contradictory nature of these vast agglomerations of very varied human life. There’s a great deal in this book that is thought-provoking and original. It has the makings (or at least the ambition) of a tour-de-force. By aiming so high, Sennett has at times missed the mark, although there are plenty of insights, some of them brilliant, that help us see cities and urban planning with a fresh eye. It had never occurred to me, for example, how much the use of the tentative subjunctive, as opposed to the harsher indicative mode, made possible a more collaborative dialogue. His suggestion that this could be applied to the process of community-level planning is immensely useful and illuminating. Whatever its shortcomings, Sennett’s latest work manages to make a powerful and heart-felt case for and open rather than closed approach to making cities, and offers an open-minded and yet forceful critique of those who would impose master plans on populations that bear little relationship to the needs of those living on the ground.